Zgrabiałe ręce z trudem unosiły kolejne kamienie. Zimny i coraz silniejszy patagoński wiatr nieźle dawał nam się we znaki. Już godzinę budowaliśmy mur, który miał osłonić nasz namiot od coraz silniejszych podmuchów wiatru schodzących z otaczających nas trzytysięcznych szczytów. Za naszymi plecami rozciągał się Południowy Lądolód Patagoński, który przemierzaliśmy już od kilku dni. With numb hands we tried to pick up more stones. Cold and howling Patagonian wind gave us a really hard time. An hour ago we had started to build a stonewall to protect our tent against gusts of wind that were getting stronger coming down from the surrounding three-thousanders. Behind our backs stretched the Southern Patagonian ice sheet, which we had been crossing for last few days. That day, after many hours of trekking on ice, we reached Circo de los Altares - a magical spot at the foot of Cerro Torre, which is one of the toughest mountains for climbers. A few people had the opportunity to enjoy the view from this place as traversing the glacier is considered as one of the most challenging trekking routes. Quito made by Marabut – a state-of-the-art expedition tent manufactured by well-known Polish company. 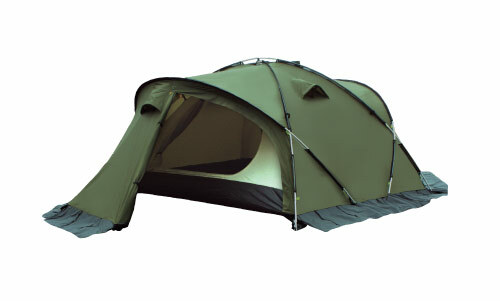 The tent is designed for two persons and is really spacious. It provides a lot of space inside (we are quite tall), and has two large vestibules, perfect for cooking and storing all the gear without the need of putting it inside the sleeping area. Tent users may sit or squat inside it, as the available height is approximately three feet. After unrolling sleeping pads, there is still a lot of space between them for clothes and other necessary items. Is it important? Of course it is ! Quito is an expedition tent and is used in the most challenging journeys in the world. The weather during such trips is often bad and sitting in a tent is a way to cope with it. Spacious interior of the tent helps to spend this time in comfortable conditions. 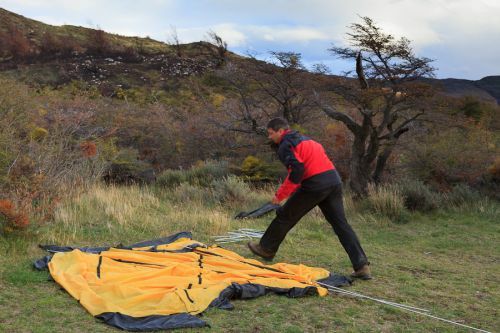 During our Patagonian trip we saw hikers using small tents of what we called a "coffin" type. They are designed only for sleeping –any other activity such as cooking and changing clothes, must be performed outside, where strong winds and rain may be ‘standard’ conditions. Quito has two separate entrances. It is very convenient, as you don’t have to wrestle with your companion to get out. It is also useful in emergency cases when two of you are able leave the tent at the same time using different exits. When we were in Circo de los Altares, I did not believe that our Quito would withstand the approaching storm. The wind grew stronger. Rain lashed harder. It felt like standing next to the TGV rail tracks with a train passing you at full speed (220 miles per hour). That was the speed of wind descending from Cerro Torre and other peaks surrounding us. The noise was scary. Every few minutes we heard a long howling sound and all night I prayed in hope to avoid its source. I knew that meeting this howling force would end our journey with a big bang. Between those howling gusts, the wind was very strong anyway. Our tent was swinging left and right, up and down with groaning and creaking sounds suggesting a real hard work. The whole night looked and sounded like this. 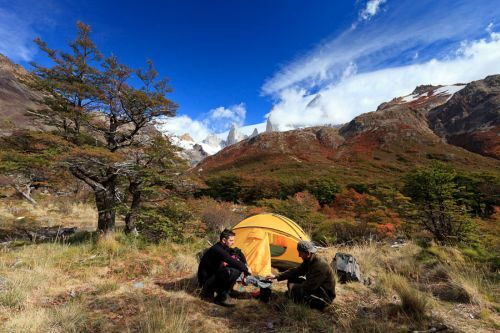 The tent “worked” similarly during other days and nights spent on the glacier, or in the mountains of Torres del Paine and at the foot of Fitz Roy. What could you expect? Patagonia is famous for its strong winds. We noticed a few minor effects of such conditions – poles were slightly bent in a few places, but we could still use them. The tent passed a really hard test. During strong winds, the tent swayed to and fro or vibrated when hit hard by the wind. Undoubtedly, its compact and low design helped to withstand even the strongest winds. We also really appreciated its resistance to rain. Generally, in Patagonia we experienced rains lashing from every direction, even from the bottom :-). But the tent didn’t leak even once. Its flysheet made of UV-resistant Polyester Rip Stop, with water resistance of 3000 mm, performed well during heavy rains that sometimes lasted all day (and we don’t talk about a drizzle here:-). The tent floor behaved in the same way. It is really solid and we tested it on different spots including ice mixed with small sharp rocks (these rocks shattered my gloves while we were constructing the protective wall in Circo de los Altares). We noticed a few minor holes in the floor, but it was nothing we couldn’t handle. Water didn’t get through the floor even once. Snow flaps passed their tests as well. Initially we didn’t; want to take them with us, as we considered them an extra weight. But eventually we decided to pack them, which proved to be a very smart decision. Without them, putting the tent up in places where tent stakes just didn’t go into the ground would be almost impossible. In such cases we put stones on the snow flaps and the tent was secure. Putting the tent up is easy, but it takes a while, as four long poles have to be precisely inserted in the separate sleeves. With a little practice the whole process is faster and more efficient. However, its final part (bending the poles), requires applying a bit of force. The best way is to put up the tent during windless weather – we experienced a few thrilling moments when our tent almost “gone with the wind”. Therefore, two people form the best team for the job :-). 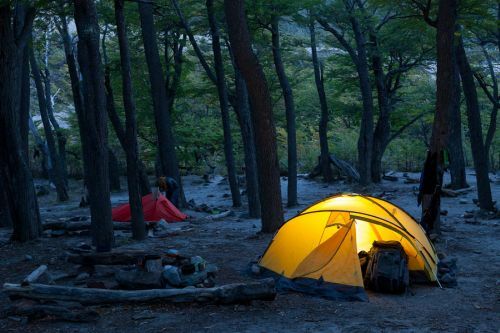 In our opinion, the individual sections of tent poles should be connected with a system that is more efficient than the existing one. While all is working perfectly when the tent is put up, the folding process is more complicated - the individual sections tend to disconnect from each other, which may be a bit annoying. The poles have to be pushed in the right direction, and it is not always possible. Compared to its smaller brother (Marabut Arco), Quito’s flysheet has better tension. In fact, there is no need for additional tensioning straps. This significantly improves its performance during the wind and rain. Ventilation of the tent is satisfying. The only inconvenience that we experienced was the excess of steam during intensive cooking inside the tent, when the outside temperature dropped below zero. This made the inner walls of the tent wet, due to water condensation. It wasn’t a real flood, but we certainly needed better ventilation. The tent is very comfortable – zippers are solid and they caused no trouble during the month of intensive use. The sleeping part is equipped with and additional screen doors that are very useful in warmer months, ensuring better ventilation and lower temperatures inside the tent. Moreover, users may enter the tent from opposite sites and this system proved to be very useful. I think the only disadvantage of the tent is its weight - 4.6 kg. It is a considerable burden, especially when you must carry it on your back with other gear for long hours. We do not know if it is possible to produce a lighter tent that would provide the same features as our Quito. However, we hope that the near future will bring us a tent performing as good as Quito (or even better) with the weight reduced by half :-). Our adventure with Quito lasted almost one month. We experienced various weather conditions: heavy rains, strong winds, temperature drops below zero degree (Celsius), scorching sun and pleasant breeze of 15ºC. The tent always provided us with safe and pleasant shelter, passing the toughest tests. Without any doubt, we may recommend this tent to all travellers.